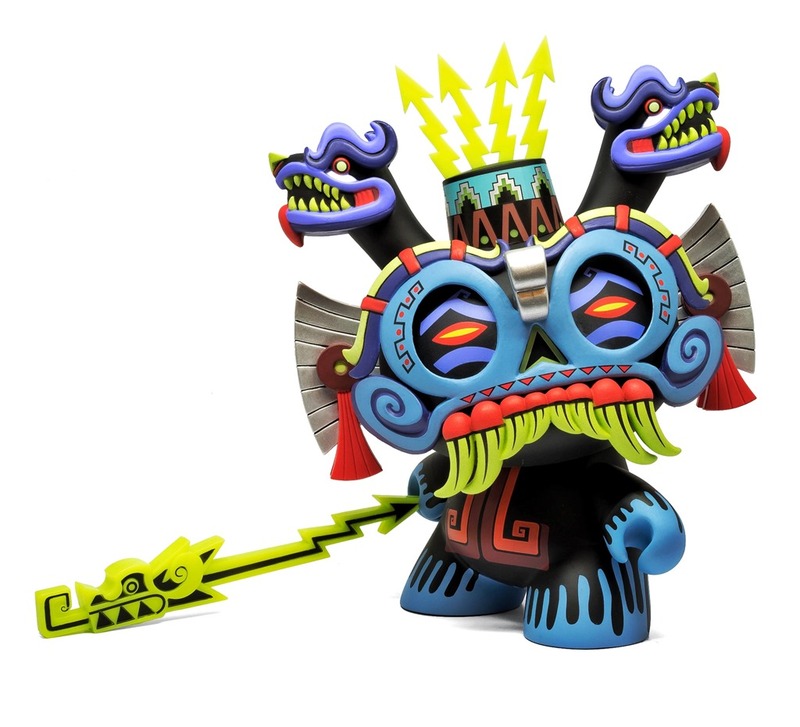 The saga of the on-again, off-again, on-again Tlaloc 8” Dunny from Jesse Hernandez comes to an awesome conclusion with the official release set less than two weeks away. His intricate take on the Aztec god of rain pushes the platform with varied 3D elements throughout from the serpent heads to the ornamental eye flourishes, headdress and staff. This one has generated quite the buzz and deservedly so. Limited to 800 pieces, the 8” Tlaloc Dunny from Jesse Hernandez and Kidrobot drops on Friday (12.14) from select retailers including myplasticheart and of course Kidrobot.com for $99.99. Oh, did we mention Tlaloc look great under a black light? Hit the jump for Jesse Hernandez’s video demonstration. Joe Ledbetter and 3DRetro just might have surpassed their officially-licensed Jurassic Park Dilophosaurus Spitter figure that debuted at DesignerCon. Enter Spitter Lava Edition. JLed’s take on the JP Dino has a streamlined, pared down look in the artist’s classic and coveted color scheme. Spitter Lava drops this Saturday (12.8) at 3DRetro’s Glendale location beginning at 11 AM, with Joe signing from 6 to 9 PM in the evening. Online sales will start after the signing at 3DRetro.com. Limited to 250 pieces, the Lava edition will retail for $70. 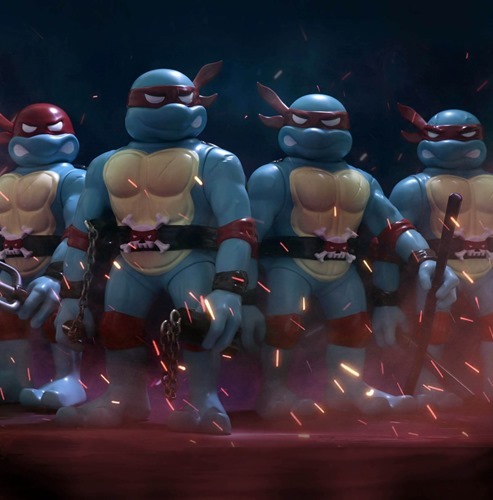 Roughly two years after the original colorway of the Real Head x TMNT officially-licensed figures, comes a second colorway. Designed by RxH’s Mori San, the new figures feature a desaturated blue-green + cream-yellow design. Each of the four turtles stand 10” with five points of articulation and come ready for action with their signature weapons. The RxH x TMNT second edition drops on Saturday (12.8) at 7 AM PST from the Unbox shop for $125 each or $400 for a set of all four ($100 discount). Athens-based DJ/Artist Elena Kazi has sent a few of her jammin’ toys across the Atlantic for Clutter’s Gift Wrapped, their cash + carry holiday show, opening on Saturday (12.8). First, a blast from the past. Originally released back in 2016, LMNTAL is the urban beat bot with all the moves, including a fierce battle mode. 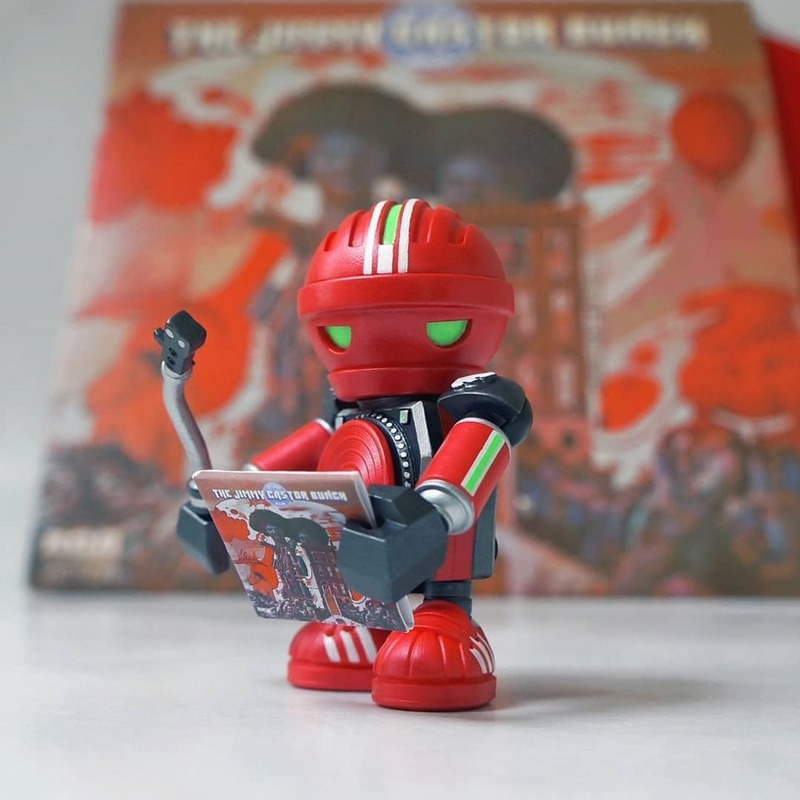 The clever design incorporates a microphone (head), spray cans (arms), turntable (chest) and record arm (weapon). The Gift Wrapped LMNTAL has some custom touches from the green deco to the mini album — the BBoy classic It’s Just Begun (1972) by the Jimmy Castor bunch. While it’s been awhile, we’d certainly welcome a new LMNTAL edition. Kazi has also sent over a heavily customized NYC version of her BMBOX resin with miles and miles of 80’s style. Bubble lettering, animal print and flashy color panels mark a generation of genre-defining Hip Hop and the lifestyle that flowed with it. 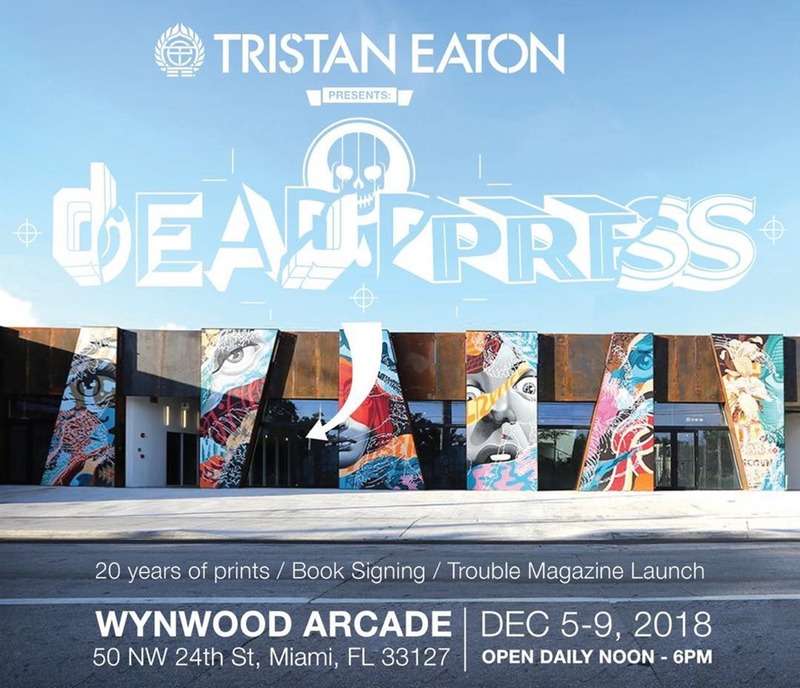 For this year’s Art Basel Miami weekend, Tristan Eaton will open Dead Press, a 20-year art print retrospective, from December 5th to the 9th at Wynwood Arcade. The pop-up exhibition starts off with a signing for Eaton’s Paintings art book ($750 published by CASS on Wednesday (12.5) from 3 to 6 PM. The first fifty to purchase the book will receive a free ‘Kiss My Assassin’ poster. The retrospective will also feature several new print releases including two brand-new XL-sized 3D prints — October March and a Geisha-based one. Dead Press will also serve as the launch of the artist’s new Trouble large-format ‘zine. The wicked one has just released a new art book filled with insane paintings, gnarly toys and process shots. 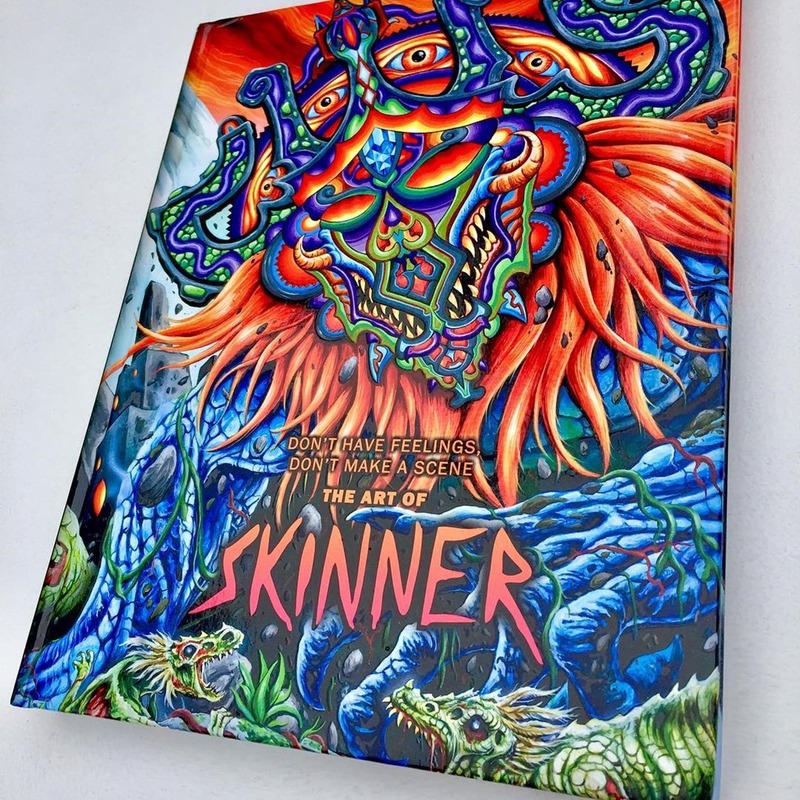 Skinner’s Don’t Have Feelings, Don’t Make A Scene art book from the rad folks at Last Gasp brings 200+ pages of the artists dark, psychedelic vision. The book is available now directly from Skinner’s web shop for $40. And… Skinner being Skinner, the first 300 copies purchased from his site include a free, signed 8x10” print. If your coffee table game is lagging, punch it up a few notches with this intense new volume. 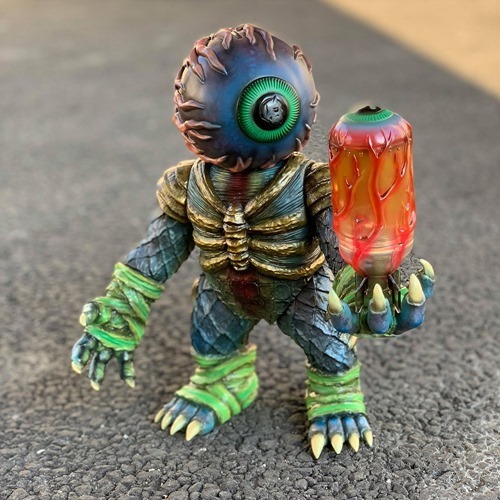 Blackbook Toy will release the hand-painted Hallucination Beast & Warhead set from Kenth Toy Works via email lottery (12.6 – 12.8). The special set brings together two Lamour Supreme x Mishka designed toys—The Beast (13.4”) and the brand-new Warhead (3.5”) for the first time. For Hallucination, Kenth wields a green + blue palette with a touch of gold for The Beast. For The Beast’s ultimate weapon—Warhead—he drops a fiery, translucent eyeful. While the set includes two magnets for extreme poses, Warhead fits nicely into its master’s hands. Limited to just 4 sets, Hallucination will be released for ¥25,000 (~$220) via email lottery running from 12.6 – 12.8 Japan Time. To enter the lottery for a chance to purchase, check and follow the directions on the official lottery page. BBT is offering Hallucination at a special value price to celebrate the release of the first Beast + Warhead pairing—hand-painted Kenth Toy Works sets typically retail for ¥30,0000+. Paradise Toys has just updated their online store with exclusive toys, original art and more from Teresa Chiba’s Inu Harigon Attack 2 solo which opened at the gallery on November 30th. There are several exclusive Inu Harigon toys available including the Yukimi Edition in clear glitter with blue, gold and pink spray. 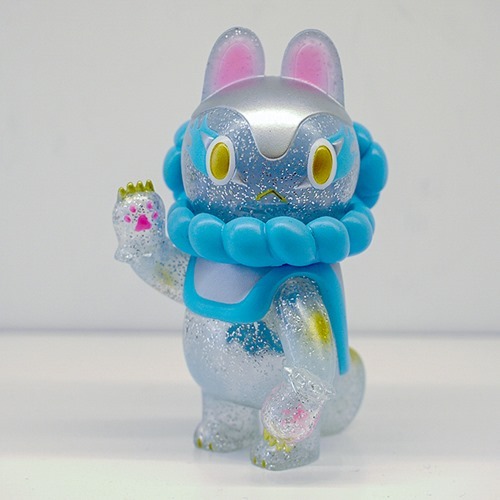 The Inu Harigon Yukimi is available for $66.67 from Paradise’s web shop. If you’re in the mood for browsing, check out all the show items.